You can create a baseball lesson plan for any grade level. From the simplest computation to the most complex numerical discussion, baseball is there for you. Statisticians have been keeping track of every pitch and swing for over a century. Managers decide who to start and when to switch players based on numbers. Every baseball situation, large and small, is conducive to mathematical analysis. Start with the small stuff for the youngest students and work your way up. “Johnny played five games this week. He had no hits on Monday, three on Tuesday, two on Wednesday and one on Thursday. He finished the week with eight hits. How many did he have on Friday?" Ask them: “If your team has 10 runs and my team has 7 heading into the bottom of the 9th, how many do we need to score in order to win?" Now crank it into the double digits. The Major League record for home runs is 73 in a season. If George has 49, how many more does he need to break the record? Pete Rose holds the Major League record for hits with 4256. If Ichiro Suzuki has 2886, how many more does he need to break the record? Perhaps no number in baseball is better known than batting average. Although it is a percentage, it is printed as three digits to the right of a decimal point. Explain to your class why 25% and .250 are the same thing. Then give them the hits and at bats for various players and have them compute their batting averages. Many classic baseball stats are basic division problems like slugging percentage (total bases/at bats) and winning percentage (wins/total games). Some are a bit more complex like on base percentage (hits+walks+hit by pitch/at bats+walks+hit by pitch+sacrifice flies) and fielding average (putouts+assists/total chances). “Ichiro Suzuki’s record for hits in a season is 262. If you have 200 hits with 42 games to go, how many hits do you need per game to break his record?" Get the discussion going by watching “Moneyball," a movie about the 2002 Oakland Athletics, who transformed themselves into winners by using an advanced statistical approach to scouting and signing players. They valued unorthodox measurements and signed players for cheap that other teams didn’t want. The term sabermetrics comes from the Society for American Baseball Research (SABR). Bill James, pioneer of the science, wrote in his 1994 book The Sabermetric Manifesto that sabermetrics was “the search for objective knowledge about baseball." This school of thought thinks traditional measures such as batting average or RBI insufficiently describe a players worth to a team. Rather, James and his students prefer statistics such as Runs Created or Defense-Independent ERA. These equations are not simply described here.. The analysis of baseball through mathematics is hardly new, but the science is eternally advancing. Now bring it all together. Pair up your students. Make them take opposing sides of a debate. Should you start Player A or Player B today? A baseball manager will look at a number of factors when making this decision. Who is pitching? Is he a lefty or righty? Which player hits better against lefties and righties? Does one player have better stats in night or day games? Is one player on a hitting streak? Then think about defense. Is one player a better hitter and the other a better defender? Does your pitcher cause more fly balls or grounders? Which player gives you the best chance to win? This gives your students a chance to take statistical information and apply it to a real situation. Have them take the data and turn it into a presentation where they try to convince the class of their viewpoint. Let them vote to decide who was most convincing. After all, you can use statistics to prove anything. 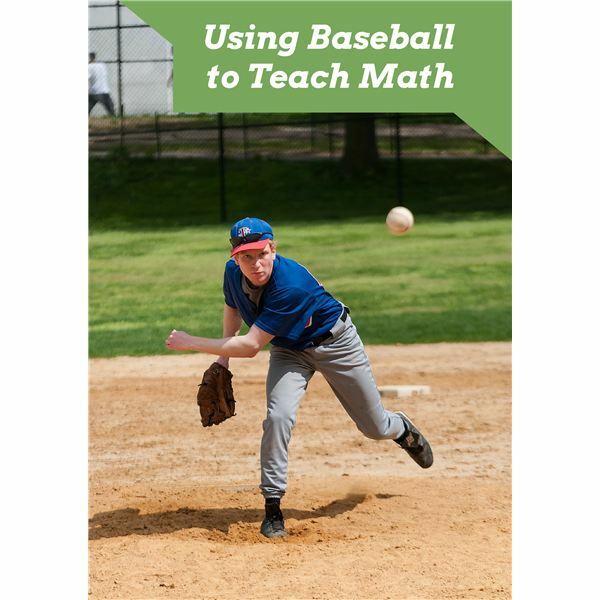 All this baseball-related math will give your class an appreciation of how number theory is applied to real life. Whether sports or business, later on they will be using math to measure, predict or prove things. A sports-based curriculum is a fun way to teach them how.